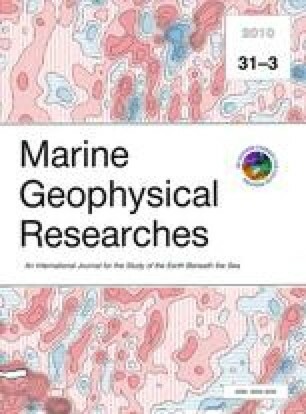 We analyze errors in the global bathymetry models of Smith and Sandwell that combine satellite altimetry with acoustic soundings and shorelines to estimate depths. Versions of these models have been incorporated into Google Earth and the General Bathymetric Chart of the Oceans (GEBCO). We use Japan Agency for Marine-Earth Science and Technology (JAMSTEC) multibeam surveys not previously incorporated into the models as “ground truth” to compare against model versions 7.2 through 12.1, defining vertical differences as “errors.” Overall error statistics improve over time: 50th percentile errors declined from 57 to 55 to 49 m, and 90th percentile errors declined from 257 to 235 to 219 m, in versions 8.2, 11.1 and 12.1. This improvement is partly due to an increasing number of soundings incorporated into successive models, and partly to improvements in the satellite gravity model. Inspection of specific sites reveals that changes in the algorithms used to interpolate across survey gaps with altimetry have affected some errors. Versions 9.1 through 11.1 show a bias in the scaling from gravity in milliGals to topography in meters that affected the 15–160 km wavelength band. Regionally averaged (>160 km wavelength) depths have accumulated error over successive versions 9 through 11. These problems have been mitigated in version 12.1, which shows no systematic variation of errors with depth. Even so, version 12.1 is in some respects not as good as version 8.2, which employed a different algorithm. Data and web applications discussed in this paper are available at the following websites: Smith and Sandwell’s (1997) altimetric bathymetry grid V12.1 (http://topex.ucsd.edu/WWW_html/mar_topo.html), SRTM30_Plus V6.0 (http://topex.ucsd.edu/WWW_html/srtm30_plus.html), GEBCO_08 bathymetry grid version 20091120 (http://www.gebco.net), Google Earth (http://earth.google.com), and JAMSTEC multibeam data (http://www.godac.jamstec.go.jp/cruisedata/e/). Data used in this study were acquired during the KR05-01 cruise of R/V KAIREI and the MR06-01 cruise of R/V MIRAI, Japan Agency for Marine-Earth Science and Technology. We thank JAMSTEC for making multibeam echo sounder data freely available. The comments of two anonymous reviewers improved this manuscript. The views, opinions, and findings contained in this report are those of the authors and should not be construed as an official National Oceanic and Atmospheric Administration or U.S. Government position, policy, or decision.